The Cobb Valley region is one of the most interesting in the country for trampers and naturalists. Enjoy the impressive mountain and bush scenery, remarkable botany and geology, and interesting human story. With many unique geological features, there is nowhere else in New Zealand that has such a complex series of ancient rocks, eroded into such distinctively different landscapes. In the Cobb Valley, rivers have cut down into the rising landscape from near Aorere Peak; northwards the Burgoo, eastwards the Waingaro, westwards the Roaring Lion and southwards the Cobb. With the onset of the ice ages, these valleys filled with glaciers, the largest was the Cobb. It carved a classic U-shaped straight valley, polishing and smoothing bedrock and dumping ridges of moraine as it went. Today's empty valley cuts through a wide range of very old rocks, some volcanic in origin, some metamorphosed through time. These include sandstones, schists, undersea fan deposits, shales and quartzites. In one or two special localities, fossils from these dim ages lie preserved; trilobites and graptolites, the advanced life forms of those archaic seas. During the ice ages much of the north-west South Island escaped the severe climate which destroyed plant life elsewhere. In many places hereabouts, but particularly on warmer north-facing slopes, plants took refuge from snow and ice, and when the climate finally warmed, were able to recolonise the land. Hence we have a beautiful and interesting array of plant life today with many species endemic to (found only in) the north-west South Island. For travellers across the tops, the kea is the best-loved and most obvious bird, known for its brialliant under-wing plumage, its insatiable curiosity and its typically parrot-like cunning. The kea is the world's only 'alpine' bird. Stoats and other predators have been at work from the tops down to the valley floors, and the forests in particular no longer abound with birdlife. However, bellbirds are still widespread, and kaka may be heard occasionally. Look for the elusive blue duck in rapidly flowing mountain streams; robins or tomtits will approach fearlessly when you stop for a rest and fantails are never very far away. Look for the giant landsnails (Powelliphanta) but remember that it is illegal to take them, or their empty shells. For those interested in the smaller inhabitants of the area, a careful search under stones in the larger streams will reveal wonderfully-adapted insect lavae, perfectly at home in the cold, clear water. Replace any stones you disturb. In 1937 a private undertaking to harness the Takaka River for hydro-electric power was started. The Government took over the scheme in 1940 and set about providing road access to the Cobb Valley. A 2.6 km tunnel from the valley was drilled through the range to meet the penstocks, some 596 metres above the power station. This height difference between the tunnel intake and the power station - the highest of any New Zealand power station - permits the generation of a considerable amount of power from a relatively small water flow. The construction of a compacted earth-fill dam was completed in 1953. When full, the reservoir is 807 metres above sea level, with a storage capacity of 25.6 million cubic metres. From the bottom of Takaka Hill on the Golden Bay side, a narrow 28 km road leads to Cobb Reservoir – care is required. In winter heavy rain or snowfall conditions can close the road for days at a time. Check the forecast for any predictions of heavy snow before deciding to overnight in the Cobb valley. There is a lookout and information kiosk on Cobb Ridge, above the reservoir, and a telephone near the dam. The road follows the lakeside to Trilobite Hut. Nearby is a camping and picnic area. On-demand transport services are available to or from the Cobb. Dogs are prohibited in Kahurangi National Park. All visitors should carry portable stoves. Salisbury Lodge, Balloon and Fenella Huts are the only huts that have cooking facilities. The purity of water in Kahurangi National Park cannot be guaranteed. All drinking water should be boiled, filtered or treated. Fires should only be lit in the fireplaces provided at huts and campsites. Burn only dead wood and make sure your fire is out when you leave. No rubbish facilities are provided in the backcountry or at picnic areas. Take your rubbish with you when you leave. Sudden, adverse weather changes are possible. Snow falls frequently during winter and may remain through to early summer, particularly around Lake Peel. Ensure you are well equipped and have the experience for what you intend doing. Take warm, waterproof clothing and plenty of food. Always inform a reliable person of your intentions and fill in hut books. Remember, your safety is your own responsibility. In normal flows unbridged streams and rivers are easily crossed, however, in flood they can become impassable and you will need to be prepared to wait until floodwaters recede. 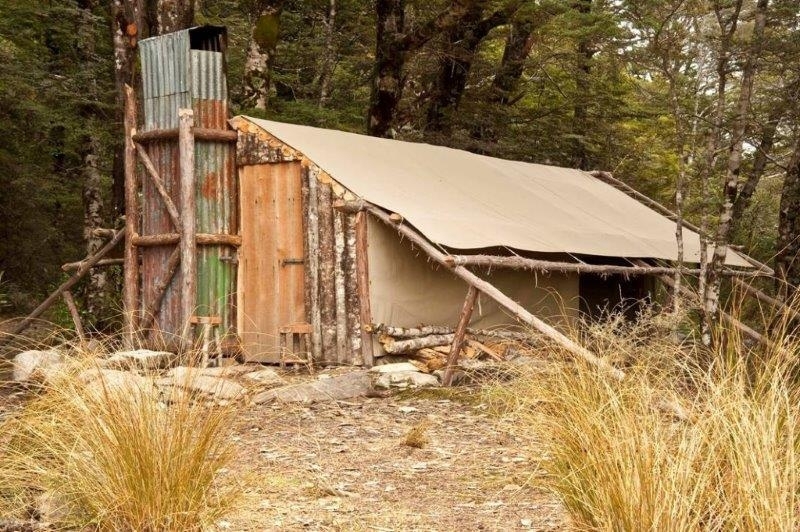 The Cobb Valley tent camp was the last one of it’s kind but action was required to restore this important part of New Zealand’s deer culling heritage.